On Wednesday, the Koblenz Chamber of Industry and Commerce (IHK in Germany) honoured the year’s best trainers and training organizations. Heinrich Werner Ochs, Managing Director of Ochs GmbH and thoroughly committed to the training of young professionals, heartily congratulated the carpenter. We are especially proud: Our graduate, Benedikt Müller, has completed his carpenter’s apprenticeship as the best in his field with an overall grade of “Very Good”. 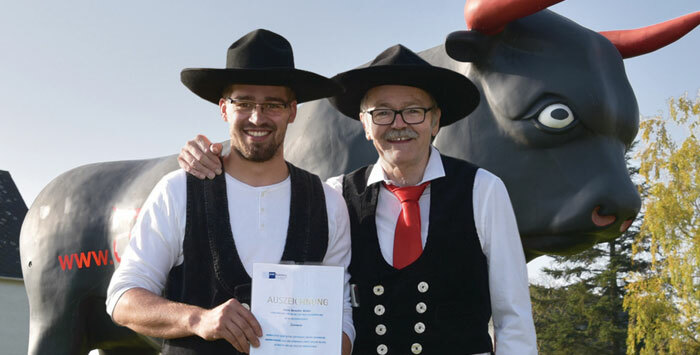 With this award, Mr. Müller has fulfilled the requisites for obtaining a scholarship to continue his studies towards master carpenter certification. Because of the increasing number of members, the builder, the operator and the architect, decided collectively on a comprehensive concept for the complete conversion and expansion of the original complex from the 1980s and 1990s. Their goal was to double the space available for training and triple that available for the overall changing room/shower/toilet facilities. Increased noise protection requirements remained a primary focus in creating both the first floor training rooms in the new structure, as well as the training space on ground level. Furthermore, the optimization of training area also serves to improve member-support thanks to the direct vantage point afforded check-in personnel. The spaciously configured cafeteria invites guests to linger while establishing a link to the tennis hall. Moreover, all administration and office rooms, a physiotherapy practice and an attractive new sauna facility have been integrated into the building. The two-storey extension was realized as a timber, wood-panelled structure using rear ventilated (VHF) facades with large-format, light, limestone-coloured facade panels. The ground floor is extensively outfitted with glass-pane, providing a view of the natural surroundings while training. The ceiling and roof construction feature wooden box elements with integrated acoustic insulation, whose visual quality conveys spatial character and provides a warm contrast to the anthracite-coloured floor covering. (Trier) A school whose architectural design could be an example to be followed: The modular timber complex located on the Wolfsberg hill was conceived to relieve the demand for space at the Integrated Comprehensive School (IGS in German). When its general refurbishment has been completed, this wooden structure is projected to be moved to the other side of the Mosel River, where it will house the future “Grundschule West” primary school. Heinz Thomas, caretaker of the school centre on Wolfsberg, is presently „very excited“. So excited, in fact, that the 64 year old is „almost nostalgic“. His enthusiasm is supported by Trier’s most extensive municipal construction project at this time. Thomas’ workplace, the German integrated comprehensive school (IGS), has been undergoing a complete renovation in a two-phase process since 2014. Schooling in containers. It certainly hasn’t been a bed of roses for those affected. 540 students and 40 teachers have had to live with, at best, provisional solutions. One part of the teaching takes place in containers – it is anticipated that the first object to be renovated, Building C (the previous Cusanus secondary school), will be available again in the spring of 2018. With this, an end to the space shortage is actually in sight. Since October of last year, a new structure is standing opposite to Building C. This three-storey building is composed of adjoining wooden modules. „It’s a great thing“, concludes Heinz Thomas, who is looking forward to the end of the Easter holidays: The 24th of April is foreseen for the first day of classes in the wooden structure, yet – and the reason for the nostalgia – the clock is counting down for the caretaker. He will be retiring after 26 years at the Wolfsberg facility, which, despite having had a fulfilling career, he „almost regrets. The way everything here is being renovated is really fantastic. And the wooden structure is in a class all its own.“ This is because it represents a completely new concept, as emphasized by the Lord mayor of Trier, Wolfram Leibe, project manager, Beatrix Maier and site manager, Sandra Stassen (both from the Dept. of Building Maintenance), during Thursday’s on-site press conference. The school was manufactured and erected by the Ochs timber construction company (Kirchberg/Hunsrück) for 4.5 million Euros. It comprises 20 classrooms, as well as rooms for other training, lounge, administration, sanitary, technical and storage purposes. All the requirements related to structural statics, fire protection, sound protection, thermal insulation and accessibility have been fulfilled. The new building is initially intended to house 150 students from the 10th and 11th grades, thereby replacing the need for containers. The building should be completely occupied following the summer break in 2018. 12.2016 | Architektur Exklusiv Lifestyle | New building, +e Kita. The two-storey concept ensures the roof towers above any shadows from the neighbouring trees; allowing it to be used as a solar-active surface. In this context, the PV-modules are not installed as an addition, but contribute rather to the child day-care centre’s overall visual appearance, somewhat like a solar caterpillar in the country, functioning as an integrated component within the building envelope. The building volume is broken up by fold-architecture designed into the roof and facade. This creates the child-friendly impression of small-scale cabins, aligned one next to the other. A flowing transition from the indoor to outdoor areas is created thanks to the completely glazed facade, which projects the building as a light, airy and transparent pavilion. south, providing direct access to the outdoor playground. The goal of the project was to avoid to the greatest extent possible any use of non-renewable raw materials. The one-storey, barrier-free structure was erected using regenerative building methods. The roofing, as well as the exterior and interior walls were built using cross-laminated-timber elements while the exterior walls were insulated with wood fibreboards. The room climate, of special importance for children, has been positively enhanced through the use of wooden building elements. On the interior, almost 60 to 70% of the wood structure remains exposed. The township of Frisingen comprises the villages of Aspelt, Frisingen and Hellingen, and is characterised by a steady growth in population. The educational facilities are most affected by this phenomenon and are being modernised step-by-step. The previous sports hall was built in 1969 and represented the oldest component in a location yet to be further developed. The sports hall was conceived on the basis of building materials that are used in a manner that most accurately reflects their natural characteristics. The architectural concrete remains relatively coarse so that the model of the individual layers and claddings are exposed. The table tennis and theatre hall has been built using glued laminated beams, which are reinforced with anchor elements made of metal in the form of twisted braiding. Considerable attention has been paid to the building’s acoustics, so that perforated or indented materials have been used in connection with rock wool fibre fill material. The carpentry work characterizing the theatre hall is supplemented by self-supporting wood panels, which feature randomly arranged depressions with varying degrees of spacing. To enhance the acoustic properties, the walls in the large hall have been outfitted with perforated or indented panels painted in grey, while the table tennis and theatre hall, as well as the motor skills room and the club rooms have been outfitted with diverse combinations of wood elements. The floor features brilliant colours with a rubber coating and carpentry work enhances the atmosphere of the interior rooms. The new sports hall completes the existing school building complex and ties everything into a perfect unit. A temporary, freely-exposed pavilion made of wood timber was designed and constructed for the Protestant and Catholic churches of the Palatinate for the National Garden Festival in Landau. The pavilion will be used by both churches for another five years following completion of the Garden Festival. The dismantling of the pavilion is foreseen in 2020. The pavilion has been designed so that all structural components can be reused and reassembled. The pavilion has an elliptical foundation spanning a surface area of 6.48m x 20.32m. The room height of the pavilion is 4m. The building material is comprised of glued-laminated beams made of Douglas fir. The draft design was continuously developed and reviewed at different scale levels using empirical modelling studies. The church pavilion’s elliptical roof structure proved to be very demanding from a design perspective. The main load-bearing structure is formed by four spatially curved, two-hinged frames made of steel hollow beams, rigidly connected with glued-laminated wooden supports. The roof beams rest in a sword-like pattern above the frame. A three metre wide „Opaion“, whose ring-formed steel frame hangs only from the roof beams, spans out above the altar. Transverse forces, as well as bending and torsional moments are concurrently superimposed, whereby the support structure system could be calculated only on spatially static indeterminate models. Concentration on the eight frame leg foot points produce highly punctual demands on the support foundation. The demanding, constructive and prototypical autonomy, as well as the vibrancy of the design concept moved the state advisory board for timber in Rhineland-Palatinate to promote this project at their committee meeting. The community of Schieren planned an extension to its primary school on the school grounds already existing in the centre of the village. This enabled them to take advantage of the present infrastructure. The size and volume of the school pavilions already in place blend nicely into the villagescape, being joined together through spacious areas and school grounds so that a courtyard-style building structure emerges. The concept envisions the overall construction being integrated in scale and architecture into the existing structure, thereby forming a new courtyard together with the child day-care centre and an existing school pavilion. The traffic areas are clearly separated from the outdoor play areas, with a total of ten new classrooms being added. Two other present classrooms were integrated into the new facility and the selection of available staff rooms was enhanced. Two distinct sections for the different age groups are perceivable from outside the new structure, being architecturally and organisationally interconnected through the central entranceway. The overall complex is distributed over 3 levels and encompasses a gross volume of 27,700 m³ with a built-up area of 5,700 m². Facilities include dressing rooms and sanitary rooms – 604 m², two assembly rooms – 97 m², a refreshment room spread over 2 levels – approx. 50 m², two karate rooms – 337 m², a table tennis room – 266 m² and a sports hall – 982 m², which can be divided into two independent areas. The facility in Lintgen was opened for business in the fall of 2011; bringing to completion, in particular, the sports infrastructure of both the Centre and the Canton of Mersch. The region is enjoying an exceptional rate of growth with respect to the local population, but also with respect to the tertiary sector. Moreover, the new school building projects currently in progress in Mersch add support to a continued increase in this trend. The new Don Bosco administration and conference centre built on the site of the Catholic Youth Foundation with approx. 2,200 m² gross floor area provides a point of orientation in the Catholic Diocese of Mainz for its youth-related work and replaces the previous Episcopal Youth Welfare Office. The existing chapel was the starting point for the design of this urban project and represents the spiritual centre of the overall complex. The new structure together with the Sophie-Scholl building, featuring overnight accommodations, and the chapel compose an ensemble, whose interior joins up with the chapel. The ground-floor environment is characterised by the lively children, youth and young adults going about their daily activities. The large dining and multi-purpose hall is aligned in an east-west direction with the capability of opening both window facades. This allows the room to be opened and expanded both to the west towards the exterior public spaces, as well as to the east towards the tranquil garden and terrace area. An additional four meeting rooms are oriented towards the rear of the garden, offering a quite environment for seminars, training sessions and conferences. The Episcopal Youth Welfare Office in the Diocese of Mainz is where the constructive and cooperative efforts of both staff and volunteers from numerous individual associations and groups are organized in the creation of effective youth programs. With this in mind, both upper storeys are configured roundabout with single- and double-space offices to facilitate concentrated work efforts. A two-storey atrium is situated between the offices and is outfitted with a kitchenette, stand-up tables and sofas to encourage communication and an exchange of ideas. It is covered with three-layered, transparent pneu-roofing and is flooded with daylight. The surrounding offices enjoy the added benefit of this additional daylight, being spatially oriented towards the atrium through room-high glass panes. The central design concept for the competition associated with the new Don Bosco Episcopal Youth Welfare Office in 2008 was made clear using a discreetly grained, untreated block of light wood: The intent was to enhance the building’s interior and exterior appearance through the use of untreated wood. The new building’s outer appearance stands out succinctly against its urban surroundings, with innovation and restrained elegance being conveyed simultaneously through the use of timber building materials. Being designed especially to enhance the work of and the work with youth and young adults, the building differs significantly from the common administrative building. The project, completed at the beginning of November 2011, is successful proof that the planning and construction of a large and at the same time high-quality object over a short period of time is entirely feasible: 13 months total, of which 7 were dedicated solely to the construction phase of this child day-care facility to passive house standards (Energy class A-A) with greened flat roofing and a photovoltaic system. The township of Differdange commissioned the architectural offices of Alleva Enzio Architectes from Pétange at the end of 2010 with the planning and execution of the project described above, whose concept was selected as the winning design in the ensuing architectural competition. The “Maison relais Woiwer” with its rounded wooden modules is truly an eye-catcher amidst the surrounding functional architecture. This harmoniously conceived building encompasses a total area of around 1,250 square metres for up to 200 children, who will undoubtedly feel both the freedom and the security offered by this facility with child-friendly furnished rooms for 10 groups, including transitional and intermediate areas. Sustainability and efficiency were taken into consideration with respect to the construction method and energy supply. The prefabricated wooden structure, including timber-frame designed walling, larch wood facades and floor-level glass panes, as well as wood-concrete-composite roofing and technical appointments – mechanical ventilation with heat recovery, floor heating and a photovoltaic system – make it possible to keep energy and maintenance costs low while complying with current energy criterion. The communities of Bertrange and Strassen began pursuing an ambitious goal in 2002 with the founding of the «CNI Les Thermes». One intercommunal swimming complex that would bring together sports, games, fun and relaxation under one roof, while attracting visitors from throughout the overall region, was to be constructed on the green meadows between the two communities. In 2004, the architectural partnership, Hermann & Valentiny et Associés, Atelier d’Architecture et de Design Jim Clemes and Witry & Witry Architecture Urbanisme, won the architectural competitive bidding process with their attention-grabbing conceptual design. The building’s foundation forms an ellipse whose distinctive recesses open out towards the natural expanse on its western side. 500m² of photovoltaic elements were integrated into the roofing to assist the combined heating and power plant in providing the necessary energy. Spaciously designed, circular ceiling openings brighten the core area of the hall. The support structure of the core, whose expanse extends through all levels of the building, is designed in classical concrete form. A special solution was needed for the materials used in the roofing structure due to the chlorinated interior air and the large span lengths of 112.5 meters. Only timber building materials can fulfil the high architectural and economical demands while, at the same time, facilitating a freely suspended ceiling wherever possible. The building radiates an astonishing lightness despite its size, thanks to the delicate wooden battens used on the walls and between the tensioning pillars. An eye catcher inside the building is the large Bordeaux red upholstered wall panelling made of synthetic leather, which accents the room in colour and deliberately provides a soft contrast to the hard materials like concrete and broken tiling used for the flooring. The upholstering on the upper level is interjected with organically formed openings that create continuity between the gastronomy and administration sections and the swim-centre activities. Large window strips in the entrance hall provide visitors with a view into the swimming area upon entering the building, enhancing their own anticipation for the bathing experience they are about to enjoy. Multiple swimming and aquatic pools in the large hall along with two long slides facilitate a diverse bathing adventure. A bistro is located in the expansive upper level. The varying visual impressions when transitioning from one area to the other, as well as the free view to the outside afforded by the broad window-vista are essential to these zones. The sauna and wellness area with its separate access remains isolated from the other zones and shielded from view. Bamboo plants screen the sauna’s outdoor area from its surroundings and encourage the interplay between insight and outlook in a landscape accented by spacious greenery and plantings. A long curved ramp winds its way between impressive wooden battens on the one side and red upholstered walls on the other as it leads to the upper level rooms. Wooden applications create a pleasant and unique atmosphere in the fitness centre. Generous areas combined with separable rooms facilitate a myriad of fitness programs, as well as numerous sporting endeavours and wellness applications. Large organically formed glass panes provide a view into the swimming area with all the colourful activity in and around the aquatic pools. Visitors are provided an extensive view of the swimming pool’s external area as well as into the surrounding landscape. The Longen family manages their vineyards on the slopes overlooking the Mosel River valley in harmony with nature while nurturing a wine-growing tradition that extends back generations. They now offer an idyllic retreat: an orchard – surrounded by orchards. Guests can experience the most pristine art of dwelling on the family estate expanding over 6,500 sqm. They place importance on ensuring the structures associated with the winery and fruit cultivation, as well as with their village setting and lifestyle, are maintained in harmony with nature. Matteo Thun, the Italian architect known for his holistic and sustainable approach to architectural and interior design, supported the family with integral planning and implementation. The architectural offices of Stein-Hemmes-Wirtz provided assistance at the construction site – the individual gardens were lovingly designed by the landscaping architect, Johannes Cox. The philosophy expresses itself in particular in the new vineyard cottages. Longen family guests reside in these tiny stone cottages made of local slate, situated amidst an orchard of fruit, walnut, linden and chestnut trees. OCHS GmbH from Kirchberg, Germany, recipient of multiple timber construction awards, was commissioned to implement the architect’s design. Each of the 20 cottages, of which several connect directly to the family lodge, features a small wooden porch and accesses its own private garden. The gardens are hedged by rows of „edible“ raspberry bushes, so that one’s own harvest can be enjoyed out on the porch. The garden’s basic form is that of a classical kitchen and herb garden – yet, guests can select their preferred style of garden when choosing their cottage. They may select a cool shadow garden, a simple cottage garden rich in herbs, a garden bounding with fruit or a fragrant rose garden. The 20 square metre slate cottages are light-filled with a clean and minimalist design. Each accommodation features the ample use of wood with white, natural fabrics and natural materials. Wooden flooring connects the inner room to the outer porch – a large glass door bridges the interior to exterior. The project received the „Architectural Award 2013“ from the State Ministry for the Environment, Nutrition, Viticulture and Forests and the Association of Architects in Rhineland-Palatinate, as well as the German Winegrower’s Association. Wood, as the natural building material, stood at the centre of Eveline Lemke’s (German Alliance-Green Party) summer tour yesterday. The Rhineland-Palatinate Minister for Economic Affairs and Energy also included the Ochs timber construction company in Kirchberg as one of her stops. The company has made a name for itself well beyond the borders of its Hunsrueck home. Representative buildings have been constructed over the past year in the private and public sectors in Berlin and in neighboring Luxembourg, as well as in France and England. One property in Mainz received the German Timber Construction Award in 2011. Impressive examples of what possibilities lie in modern timber construction were shown the Minister and her delegation by Heinrich Werner Ochs, director of the 200 year old company comprised today of almost 100 employees. The company has been innovative in timber engineering with its multi-storey wood buildings and contributes to further development and research at the European level. Lemke underscored to positive ecological balance of wood as a building material. Wood homes require 50 percent less energy when compared to traditional buildings made of stone and cement. In addition, the emission of harmful greenhouses gasses is reduced by 75 percent. Lemke announced a forthcoming amendment to state building regulations due in the Fall, which, along with other objectives, will facilitate timber construction. BUILDING WITH WOOD: How would you assess the projects whose builders were actually „Building Groups“? Grad.Eng. (FH), Arch. Dominik Agsten (Planning + Project Development): Building with Building Groups should be assessed positively, yet it requires a high degree of coordination and, in particular, communication. We have gathered quite varied impressions from the projects we’ve participated in (4 and 5-storey multi-family, timber structured homes) in Berlin and Frankfurt, Germany. Instead of one builder, there may now be 6 or 7 to deal with (depending on the project); each with their own ideas for their respective accommodation. The situation compounds when the differing conceptions for the common-use areas are considered. A clear structure and moderation are essential if the building group advisor/site manager is to achieve satisfaction. Are there differences to „normal builders“? If so, what are they? Building groups are a social phenomenon rather than a technically-minded group of builders. In most cases, the groups form out of existing networks with good educational backgrounds. In previous times, such builders would have taken on their individual projects by themselves. These days, building is hardly affordable in appealing urban building locations, even for the „well-to-do“. Consequently, Building Groups are frequently motivated by economic reasons. The goal is to save money through their common initiative. Yet, individual demands and expectations are rarely reduced. In addition, the communal aspect must also be considered. The willingness to cooperate within the Building Group plays an important role. This frequently goes well beyond the common building project, itself, as the example of designing common scenarios for a senior living dwelling illustrates. Planners and implementers must be cognizant of the overall requirements at all times. In your opinion, will the „Building Group“ as a concept increase in significance or is it merely a marginal phenomenon? There is absolutely nothing wrong with the idea of living together in a common dwelling place while taking advantage of possible savings in building costs and the increase in mutual social support that go along with it. Therefore, we believe there is still great potential for the Building Group concept. This is particularly the case in urban areas, where building property is both rare and expensive. The more homogenous the group, the greater the chance is that the common initiative will be successful. In any case, ideas and conceptions for a common object should exist. Ochs GmbH will continue to partner projects undertaken by Building Groups and is already preparing timber structures for existing Building Groups. In 2011, Ochs GmbH built an ensemble of 16 individual, horizontally and vertically stacked „single-family homes“ in collaboration with Kaden Klingbeil Architects in Berlin-Friedrichshagen, Germany. The supporting, bracing and separating walls, as well as the building’s roofing structure were erected using highly thermally insulated timber frame construction with non-combustible structural surfacing, while reinforced concrete, filigree ceilings separate each floor. Timber construction in Rhineland-Palatinate. Active in the state for the state! Research pavilion in segmental construction design developed by both architectural institutes at the University of Stuttgart. The research pavilion received the special award „Wegweisende Innovation“ (innovation for the future) at the Baden-Württemberg Timber Construction Award on 22 June 2012. The Ochs company is one of the main sponsors of this project. Gehlweiler is transformed into Schabbach in the year 1842! The setting in Gehlweiler was built with a tremendous amount of effort. Foamed polystyrene approximating boarding was applied to the wood substructures erected by Ochs GmbH beginning in January. Fascinating insights behind the scenes of “Heimat IV” by Edgar Reitz. The first museum building commemorating the legendary Battle of Alésia was recently dedicated in the French region of Burgundy. The design from architect Bernard Tschumi features a cylindrical building with a wooden facade that signifies the Roman fortress of the period. The house top of the circular building is planted with bushes and trees that provide a seamless transition to the natural surroundings. Holz-Zentralblatt (gazette for wood-related topics) – Germany’s National Garden Show (BuGa) 2011 in Coblenz not only puts plants and flowers on display for its visitors, but it acquaints them with the regional woodlands, as well. Moreover, it accentuates the properties of timber in demanding architectural design and construction. Wooden structures that are impressive, both in their creative as well as in their technical qualities. The “Treehugger” pavilion for the Coblenz Chamber of Skilled Trades demonstrates that the local woodworking craft is capable of precisely implementing complex planning specifications.